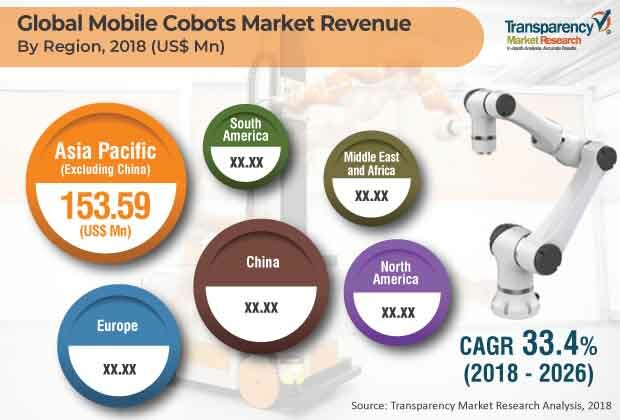 According to a new market research report, published by Transparency Market Research, the mobile cobots market is expected to reach US$ 4,472.53 Mn by 2026, expanding at a CAGR of 33.4% from 2018 to 2026. According to the report, the mobile cobots market is likely to continue to be influenced by a range of macroeconomic and market-specific factors in the next few years. In terms of demand, Asia Pacific is projected to lead the global market during the forecast period. The market in the region is likely to expand at a CAGR of 35.9% from 2018 to 2026. South Korea and Japan are expected to be major contributors to the mobile cobots market in Asia Pacific during the forecast period. A mobile cobot (mobile collaborative robot) is an intelligent, transportable robot that can assist humans in a shared workspace. Mobile cobots are moving platforms wherein cobots are mounted on mobile robots. These are automated machines. It is an emerging technology that is capable of moving within a set environment. Apart from the manufacturing industry, mobile cobots are used for research and exploration. Currently, use of mobile robots has extended to the industrial sector. In the recent years, there has been a significant rise in the demand for industrial robots in the automotive sector. This can be attributed to increasing customer demand for customization in their cars. Unlike industrial robots, collaborative robots are not dedicated to only a single task. Hence, manufacturers are now switching to collaborative robots. Inclination toward industrial automation is acting as a driver of the mobile cobots market. Robots have been utilized in industries for a long time. They have made the human work easier by running large industrial settings. Robots in factories have typically been large, caged devices that perform repetitive, dangerous tasks in place of humans. Moreover, rising labor costs in developing economies, mostly in material handling industries, are driving the demand for cobots. This is primarily due to economic growth of industrialized countries. The global mobile cobots market has been broadly segmented in terms of weight capacity, application, end-use industry, and geography. Based on weight capacity, the market has been segregated into 1 to 3 kg, 3 to 5 kg, and 5 to 10 kg. Among these, the 3 to 5 kg segment accounted for a major share of more than 50.0%, in terms of revenue, in 2017. The segment is anticipated to expand at a CAGR of 33.5% during the forecast period. In order to fulfill the global demand, various manufacturers of mobile cobots are currently focusing on research and development activities in order to invent advanced applications of mobile cobots. Cobots are gaining popularity among manufacturing companies and different industries. The primary factor boosting the global mobile cobots market is decline in costs of collaborative robots over the last few years. Upfront costs of cobots are 20% of those of traditional robots with an average payback period as short as six to eight months. Also, installation of cobots requires minimal investments and time. In terms of application, the mobile cobots market has been classified into shelf units, conveyor belts, automated pallet forks, robotic arms, and safety units. In terms of revenue, the robotic arms segment accounted for a major market share of more than 40% in 2017 and it is anticipated to expand at a CAGR of 33.6% during the forecast period. As per TMR analysis, in 2017, Asia Pacific accounted for the maximum i.e. more than 30% share of the global market, in terms of both revenue and volume. The Asia Pacific mobile cobots market is primarily driven by increased investments in modernization of infrastructure and continuously rising number of manufacturing facilities in the region, especially in developing economies such as South Korea and India. The mobile cobots market in Asia Pacific is expected to witness further innovations and advancements in the near future, as several leading manufacturers are investing in research and development activities. Furthermore, the rising demand for electronic products and increasing need to automate production in the region are driving factors for the market in Asia Pacific. The research study includes profiles of leading companies operating in the global mobile cobots market. Market players have been profiled in terms of attributes such as company overview, financial overview, business strategies, and recent developments. Some of the key players operating in the global market are ABB Ltd, Aubo Robotics, Fanuc Corporation, Kawasaki Heavy Industries, Ltd., KuKa Ag, Precise Automation, Inc., Rethink Robotics, Robert Bosch, TECHMAN Robots, Universal Robots, and Yasakawa Electric Corporation. Various business strategies are being adopted by leading market players. Companies are focusing on expanding their business by forming strategic partnerships and offering innovative solutions.